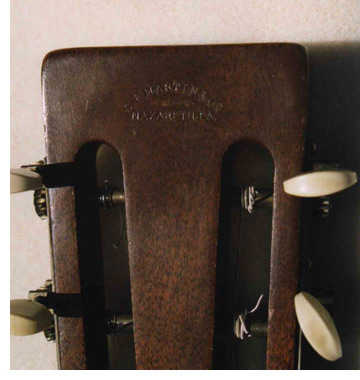 I am listing this beautiful Martin guitar for a friend who has owned it (rarely played) since 1957. The documentation received from Martin verified this is an 0018 flattop from 1929, serial number: 40125. From what we have found, there were only 227 of these made in 1929 which obviously increases the rarity of the instrument. There is no Martin decal on the front of the head, but the back shows the imbedded stamp (reading "C.F. Martin & Co, Nazareth PA" which was typical for Martins through the 1920's. It was originally designed to be a nylon string guitar but with a very narrow neck to simplify matters for steel-string players. It is STRONGLY advised that it be kept as a nylon string guitar, though VERY light steel strings could be used at the owners risk. N.B. There is no pickguard and there are 20 frets (as opposed to the more typical 19 frets). It also has "simple" soundhole rings. • the normal dings and scratches (including a few from someone who used a pick). We both thought it best to leave the instrument as-is to allow the buyer to chose what, if any, repairs should be made. Thus, this guitar is sold as-is. It comes with a slightly worn chipboard case. Otherwise, she is in very stable and playable condition with very low action. The sound is incredibly even and warm with a projection that is beyond anything I have ever heard from an instrument this size. This guitar would be a tremendous instrument for a collector, classical guitarist performing early 20th-Century American works or a traditional guitarist who needs an exceptional instrument for nylon string work. Tuning gears: "ivoroid" in an "open" peghead.